Visit CodeClub.org.uk to start your journey! Hello again friends, it’s time for another Meet The Makers interview! This week I had a chat with Liz Smart, North West Coordinator for Code Club. What’s Code Club you ask? Well hold your horses and we’ll get into that in a minute. There was loads of other stuff to talk about as well. Liz has been a regular attendee at MakeFest, in fact she’s been at every one so far so I wanted to know how she got involved. Not only with Code Club but MakeFest too. As usual you can LISTEN TO THE FULL PODCAST or read the much shortened transcript, or even do both I suppose if you’re so inclined. It’s up to you. So let’s do this…. DAN: To start off with Liz can you tell us what Code Club is? LIZ: Essentially it’s a volunteer led movement. We have a massive network of really amazing educators. They can be teachers, librarians, tech professionals, students, parents and all kinds of things. A really diverse set of people with a passion for digital making and they want to inspire the next generation. To do that they take that passion out to the community where the children are. So it’s very much about going to the children in venues they’re used to going to and getting them engaged with digital making. That’s the front end of it and then behind the scenes there’s a charity that creates free projects and resources, provides support and helps the clubs to grow and continue right across the UK, and even beyond. DAN: It’s been going since 2012 I think, is that right? LIZ: Yeah it started in 2012 with about 100 clubs which were all after school clubs. Initially it was kicked off by teachers and people from the tech industry. It’s just snowballed from there really. We aim at 9-13 year olds, last couple of years of primary school and first couple in high school. DAN: I saw that relatively recently you teamed up with the Raspberry Pi Foundation too. LIZ: We did, we’re an education programme within the Raspberry Pi Foundation now so it’s great. We’ve got colleagues at Coder Dojo which is another great movement, the Raspberry Jams, AstroPi, there’s loads of great education providers. We all link up to share materials and help each other so we can reach more children. DAN: Yeah and it’s amazing how many clubs there are now, I was just looking online before and there’s clubs in other countries not just the UK. LIZ: I think for the first time by the end of this year there’ll be more clubs internationally than in the UK. There’s around 6800 clubs in the UK now. So that’s around 95,000 kids per week. Internationally it should get to that level hopefully by the end of the year. We’ve been busy translating the projects into different native languages. We’ve got 28 different languages at the moment and we’re partnering up with not for profits in different countries to help it get off the ground. It’s really exciting and really great to see. DAN: 95,000 kids per week? That’s amazing, that’s a really good number isn’t it? LIZ: Yeah and we have a high percentage of girls, we’ve got clubs in deprived areas, it’s a real good mix of kids that get to go and they’re all so creative. 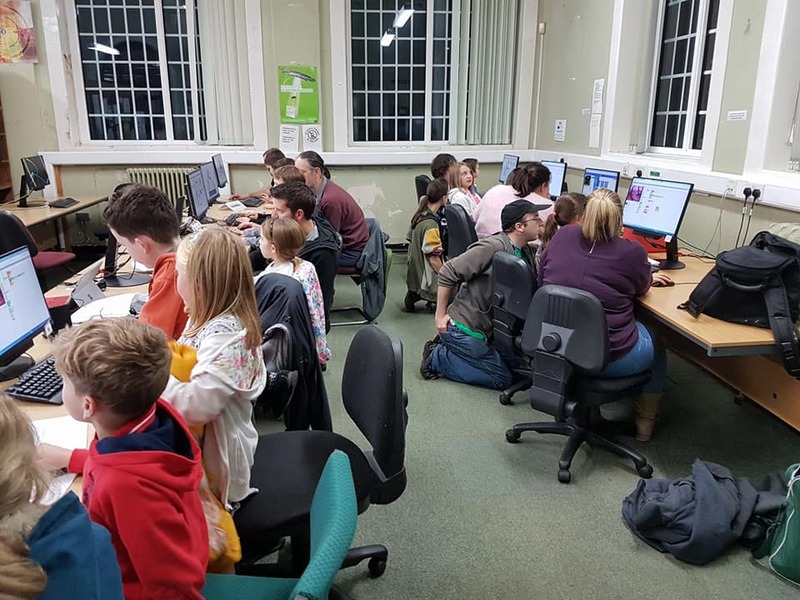 Kids having fun at a Wirral Code Club session. DAN: I know it’s about teaching coding but what kinds of activities do you do with them? LIZ: The core workshops are all step by step guides that the children go through and there’s challenges within them. We have different programming languages. So they start off with Scratch which is a nice visual language, drag and drop, designed for kids. Great for the younger ones as a first language. We’ve got HTML projects, Python projects. SonicPi so creating music and special effects for animations, that kind of thing. Blender 3D game assets, building up to making bigger animations. There’s the physical computing side as well. So there’s the Pi obviously, using the Sense HAT. We did some projects around having a Sense HAT on the International Space Station and children creating code that would be run up there. There’s a whole variety and it just depends on the ages of the children in the club and what the volunteers want to do. It’s all really flexible, you can choose the bits you want to do, work through and get certificates. It’s really cool. DAN: You mentioned that it’s volunteer run so how does someone get involved if they decide it sounds good and they want to try. Do you have resources to help them do that kind of thing? LIZ: Oh yeah, it’s all volunteer based. To get involved just go to the website at codeclub.org.uk and there’s even online training you can do. There’s star clubs you can visit. So the one at Liverpool Central Library where MakeFest is gonna be is actually a star club. You can get in touch with them, go down, see how it all works and chat before starting your own club. DAN: You don’t need to be an expert either do you? I noticed that’s something you stress in the documentation. I imagine a lot of people are not confident they can do this and worry they don’t know enough about computing, but anyone can have a go right? LIZ: Yeah I think it’s so important to say as well that you’re not expected to have the answers. It’s so great if you get a question actually and you don’t know the answer. The children see you going through the logical process and you’re prompting them for ideas too. I don’t think anyone ever really considers themselves an expert in coding or working with children and all the other things involved. People have got different qualities, you’ll find developers who’ve been coding for years and others who’ve worked with children for years, but it’s about making the club work for your strengths. We definitely have a lot of parents get involved because they want to run a club for their children. They have no background in computers at all but really run with it and learn alongside the children. DAN: So how did you come to get into all this yourself? LIZ: I started running a club at my daughter’s school. I was just looking for something for her to do in the local area. I stumbled across the website and thought it looked great. I got in touch with the school and it all went from there. I’ve been running that club for 4 years now and I miss it when it’s not on. The kids really motivate you, they’re really great. So it started as being a volunteer first and then the job came up to be a co-ordinator and it was just perfect, I love it! I get to go and meet volunteers, speak to people who want to get involved and visit clubs all over the North West. DAN: So you’re gonna be at MakeFest with Code Club North West and one of the Code Clubs from the Wirral are also gonna be there to? LIZ: Yeah, it’s really exciting. I think I’ve been on a different floor every time I’ve been so we’re on a bit of a tour of the venue. Wanna make a banana piano anybody? Yes please! DAN: What are you gonna be doing at the event? LIZ: I’m joining Wirral Code, John and all the other volunteers there who run fantastic clubs in Wirral libraries. We’re going to be running a drop in Code Club this year. We’ve got some mini projects lined up. Scratch, Python, a big box of bits, we’ll grab some Makey Makey stuff from that and probably bash some fruit, maybe some robotic arms. All kinds of different bits and pieces but we just want people to come along and give things a try really. Make some cool stuff and show us, because we love seeing all the different creations. We’re really really looking forward to it. DAN: I’m interested in the bashing fruit stuff, are you gonna make some smoothies maybe? LIZ: Yeah that tends to happen, whenever we do a Makey Makey Banana Piano it tends to get so bashed by the end of the day it really is just a smoothy encased in a banana skin. DAN: I love the idea of a banana piano, that’s fantastic. LIZ: Yeah I tried to do it with an orange, it didn’t go well, don’t do that!! DAN: Good advice indeed. Thanks very much for joining us today Liz. We’ll see you in Liverpool on June 30th! LIZ: No problem, looking forward to it. See ya! A big thanks to Liz for talking to me. 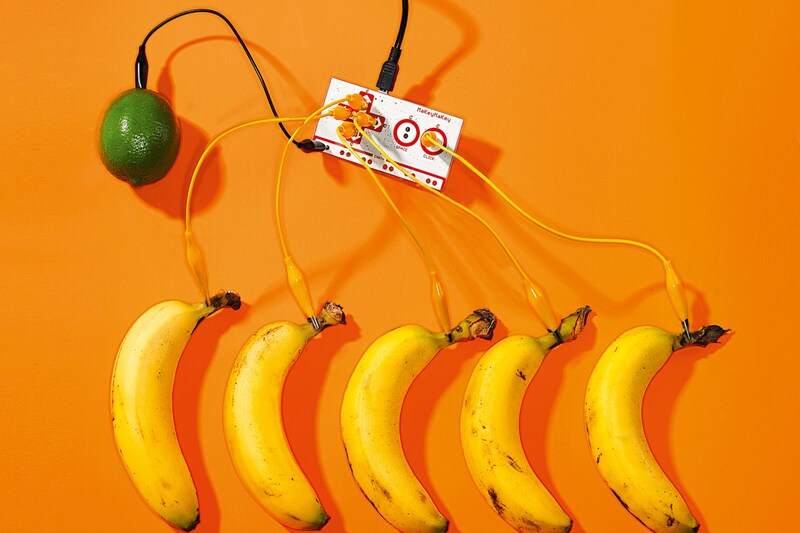 I can’t wait to try playing a banana piano at MakeFest now. If you’d like to get involved with Code Club you should head to their website and make a start. There’s loads of great resources and support on offer. You don’t need to be an expert by any means. It’s a great community and someone is always nearby to help. Speaking of being nearby to help, we still need volunteers for MakeFest. We need your help to set up and run the event. So if you want to be a superhero fill out the form and join our team. You can also book some free tickets if you plan to attend and help us out by indicating your interest. It’s good to know some idea of numbers and helps us get support. Right, that’s it for this episode. Don’t forget you can listen to the full audio and subscribe to the podcast. I’ll be back next week talking to some more Makers. Can’t wait. Previous £500 giveaway for your maker project!